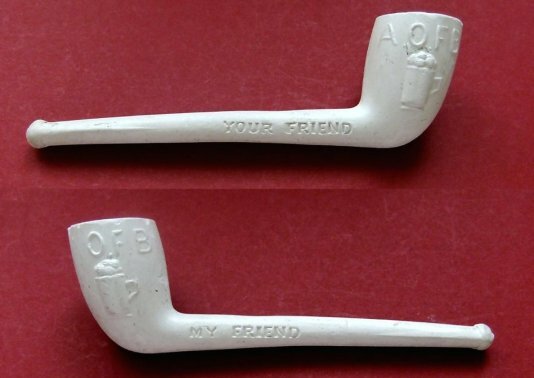 Several different smoking pipes were manufactured although not all were A.O.F.B. sanctioned and deemed as ' official.'. 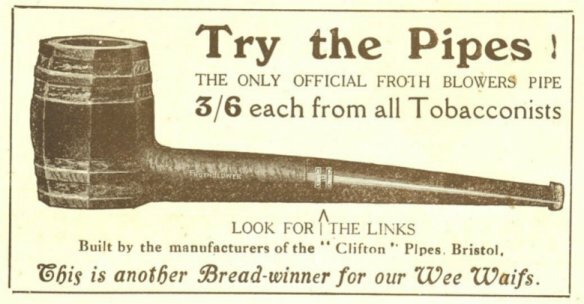 As the advert says for the Clifton Pipe - ' the only Official Froth Blowers Pipe ' , none have yet been seen, but there is bound to be some out there , Anyone ? Other pipes may have sanctioned at a later date, but as yet ( 2013 ) unconfirmed . 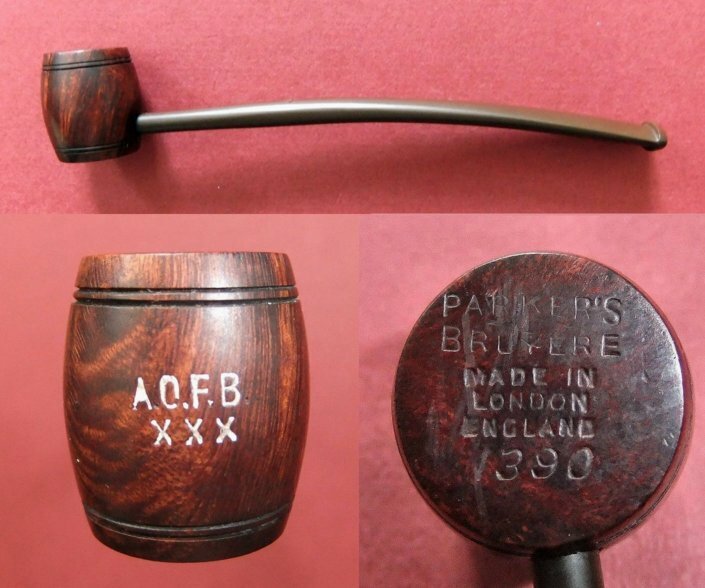 'Unofficial ' Bruyere Pipe made by Parkers. 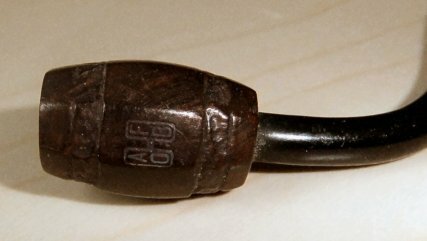 Cigarette/cheroot holder with a Capstan from the 1920's. Close up of the 'bowl' showing the engraved A.O.F.B. links. There was a well documented court case relating to the manufacture of pipes which ultimately led to Bert Temple travelling to the Houses of Parliament to address MP's to redress false accusations of the origins of A.O.F.B. items. Many had accused the A.O.F.B. of using 'cheap foreign labour ' in the manufacture of items. Bert Temple was rightly angry at these allegations as the suppliers of merchandise employed Ex Servicemen and disabled Ex Servicemen that found other employment hard to gain after the Great War ( First World War ). 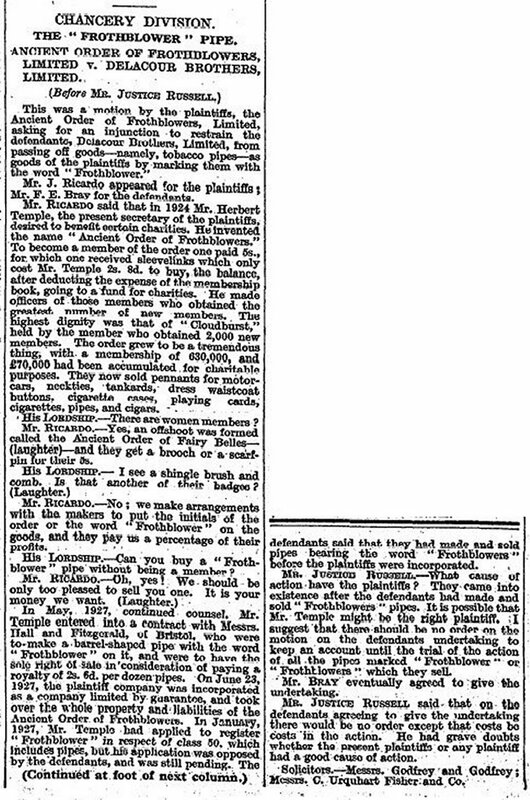 The court case report regarding pipes - from the Times Newspaper 8th February 1928.